I’m back with another cookie for the holiday season! These cookies (and cookies in general) are great everyday. The amount of cookies to eat at once is debatable too. Ha ha. Are you in the holiday spirit yet? For us, we have our little Christmas tree decorated and the decorations outside are slowing being assembled, put up, and illuminated. We are looking to add to our cute woodland moose outside, perhaps some deer or a squirrel or another moose. Plus some new lights. Do you decorate your yard? The newest addition to this list is a really simple and delicious Peanut Butter Cookies with Chocolate M&M's! All the ingredients to make these scrumptious cookies. Full amounts and complete instructions are available below. I like to press extra M&M's on top. Now it's ready to be baked! These cookies only need to baked for between 9 and 11 minutes. The cookies will be puffed and golden-brown on the bottom. What’s awesome about these cookies? Makes 48 tasty cookies: It has the delicious combination of peanut butter and chocolate! I like to use a creamy peanut butter and a good cup of chocolate M&M’s mixed in and on top of each cookie. Whenever a recipe makes this much, Scott always brings it into his work to share with his co-workers because, let's face it, Scott and I aren't known for our self-control around baked goods. Whenever Scott brings cookies into work, they never last long, which I take as a complement. We still have not figured out whether all his co-workers get in on the cookie action or whether it's one person who can't get enough, but either way it saves Scott and I from ourselves. The texture is wonderful: Soft and chewy with the crispy bite of the M&M’s, these cookies are so satisfying and addictive to eat. Cute to look at: These are smallish 3-4 bite puffed cookies with colourful M&M’s on top! These cookies are great for parties, holiday cookie exchanges, get-togethers, birthdays, etc: This recipe can be scaled up or down too so it’s easy to bake more or less and bring the amount you want. Easy to prepare (best made with a stand or electric mixer) with quick baking time (just 9 to 11 minutes) so you don’t have to wait too long to eat them. You can make them ahead of time: Cooled cookies keep well in an airtight container in the refrigerator or at room temperature for up to a week. You can also freeze the baked cookies for months. Reheat the cookies in the oven at a low temperature (250-275 degrees Fahrenheit) from frozen or thawed at room temperature. Start checking after 10 minutes to see if the cookies are ready. Preheat the oven to 350 degrees. Line a large baking sheet with parchment paper. Using an electric or stand mixer, at medium speed, cream together the butter, white sugar, and brown sugar until fluffy and well-combined. Next, mix in the peanut butter, eggs, and vanilla extract until well combined. In a separate bowl, whisk together the flour, baking powder, and salt. Set the electric mixer to low speed and carefully add the flour mixture to the bowl, scraping the sides down if necessary, until the mixture is combined (no dry ingredients are visible). Using a spatula, fold in ¾ of the M&Ms, making sure to distribute the pieces throughout the dough. Measure out 1-inch balls of dough, form a ball with the palms of your hands, and place each ball least an inch apart on a baking sheet. 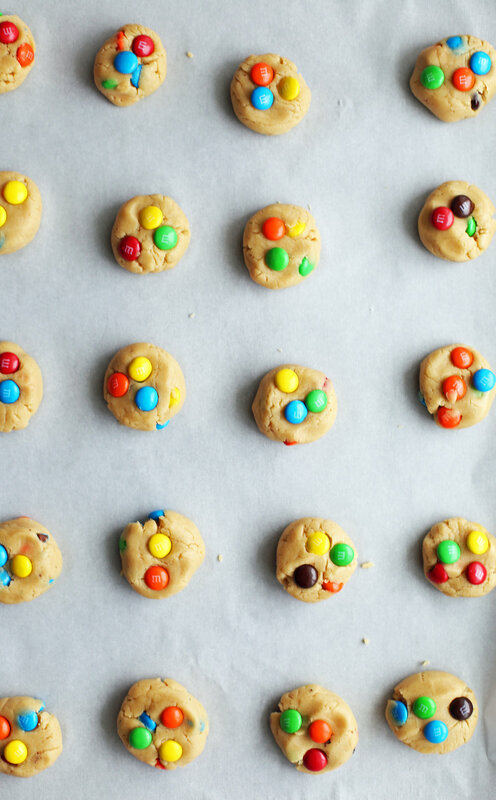 Slightly flatten each cookie with your hand and gently press in the remaining ¼ cup M&Ms on the top of each cookie. Bake for 9-11 minutes, until puffed on top and lightly golden on the bottom. Let cool slightly before eating (cookies will be soft right out of the oven, but will harden as it cools). Store cooled cookies in an airtight container in the refrigerator or at room temperature for up to a week. Recipe can be scaled up or down. Nutritional calories represent one serving with 48 servings total.